Federation Council approves scavenger oil benefits bill | Russian Legal Information Agency (RAPSI). MOSCOW, November 28 - RAPSI. The Federation Council has approved on Wednesday a law on benefits for scavenger oil deposits. The document drafted by the Energy Ministry stipulates the use of export customs duties amounting to 10 percent of the ordinary export rate in relation to scavenger oil. The corresponding amendments will be introduced to the law on customs tariffs.Preferential rates will be applied to ultraviscous oil and oil with peculiar physical and chemical features produced at deposits located in full or in part in the Republic of Sakha (Yakutia), the Irkutsk Region, the Krasnodar Territory, the Nenets Autonomous Area, the Yamal Peninsula, on the bed of the Russia section of the Caspian Sea, and within Russia's internal sea and continental shelf borders. The law will come into effect on January 1, 2013. The article on the order to establish benefits will come into effect on April 1, 2013. By March 1, the government should adopt regulatory legal acts to calculate the export duty rates for oil and specific categories of oil products. Export customs duty rates for crude oil and some oil products will be calculated for a term of one calendar month and will be applied from the first day of each calendar month following the end of the monitoring period. From October 15, 2008, the monitoring period for crude oil commences on the fifteenth day of each calendar month until the fourteenth day of the following calendar month. 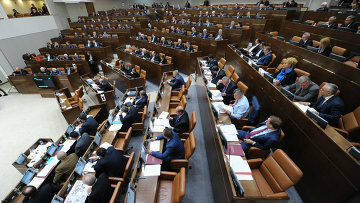 16:45 28/11/2012 The Federation Council has approved on Wednesday a law on benefits for scavenger oil deposits. The document drafted by the Energy Ministry stipulates the use of export customs duties amounting to 10 percent of the ordinary export rate in relation to scavenger oil.